November is almost over, and those participating in National Novel Writing Month are in the final push to meet the 50,000 word count goal. I’m not participating in NaNo this year, but I’ve been paying attention to people who are writing their first, third, or many-enth novel as part of the celebration. 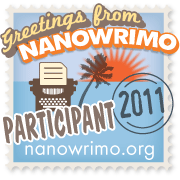 I’ve had a fuzzy vision of NaNoWriMo for years as an activity people participate in all alone. Maybe they put a logo up on their blog or tweet their word count, but otherwise they might as well be writing in any other month of the year. This year I realized that NaNo is about more than just setting a high goal and going for it. It helps you build an accessible community of writers – locally and online. My local NaNoWriMo group held writing meetups every Monday night at the public library. Participants gathered together and wrote on their individual stories. In other (perhaps larger) cities, they held writing meetups several times a week. Why are writing meetups such a good thing? Because it is a time you set aside when you tell your family, friends, and the world “I am not available right now. I’m writing.” For many of us, this can be hard to do in everyday life. At Clarion West Nancy Kress told me that it is difficult for people to accept this concept. Your loved ones want to be with you (that’s why they’re your loved ones! ), and they don’t always understand why you want to be alone in a room making up stories instead of being with them. But a writing meetup seems to me like a type of mini-residency. For two or three hours, you’re whisked away to an island. And the best thing about this island? All the other people on it are writers. Being around other writers is one of the best motivational tools I know of for reaching your writing goals. It lets you know that writing isn’t such a weird, hopeless thing to do. And there’s a camaraderie that you only find with your artistic peers. When a fellow writer asks you “How is your story going?” it isn’t a polite question. It’s a conversation starter. At UAF, I had some of the most helpful story discussions in the elevators of the English building on the way to class with my fellow students. Characters I’d grown tired of writing came alive again in the hallway of the 8th Floor of the Gruening Building as I walked from the printer back to my desk, all because I happened to pass another MFA student on the way and they asked me “How’s your writing going?” The same kind of conversations happened at lunch, at 4:30AM on my way for a glass of water, anytime and anyplace at Clarion West. Physical proximity with other writers transforms our work from the impossible to the attainable, from thick forest into a path. Intellectual proximity can be just as helpful. There’s Google+ hangouts, which are awesome in the way things of the future should be, but it’s here now. If you don’t have a NaNo group in your area, you can create a Google+ NaNo hangout with your writing friends from around the world. Mary Robinette Kowal, author of Shades of Milk and Honey, created a Google+ hangout while she was at her local NaNo writing meetup. People could write along with the group, and then chat with each other during the breaks. No matter where you are in the world, if you have the internet then you can find the NaNo resources to connect with other writers. And once the month is over, you’ll have a strengthened community that you can turn to through the rest of the year as you revise your novel or begin work on other projects. Now that I have a better understanding of how NaNoWriMo works, I’m excited to start planning ahead for next year.